From prehistoric time, Burma attracted various races from different directions. Kshatriya (Aryan) adventurers from India were the first group to give a civilization to this land. Fertile plains of Irawadi and Chindwin river attracted them more than Northeast India. The Irawadi river played a major trade route in development which is navigable up till upper Burma. Dense forest land provided all their need for building palaces and cities; also the land is rich in minerals. Waves of Aryan migration before the Christian era (BCE) gave birth to several dynasties all across. Not mere religion and culture, it was a large-scale transportation of Indian civilization in all its form, systems of philosophy, institution of kingship both Hindu and Buddhist, customary law, mythology, literature, art, music, urban planning, building technology, astronomy, astrology, writing system, calendar, medicine, agriculture, irrigation system etc. Vedic/Hinduism never sent religious mission beyond its frontier, it is only because of migration of Indians we find Vedic/Hindu religion and Indian civilization in this region. In the beginning they were true Indian states but with passing of time, long isolation from their origin and through reaction with the local needs they developed according to their own genius and taste, although the family resemblance never lost that they owed to their common origin – India. Indians of other class: priests, traders, artists, engineers, sculptors, scientists, astrologers also followed. The land route of migration for North-Indian adventurers was always through Manipur and also from Manipur itself. Colonists of Orissa and South India (Krishna, Godavari river basin) reached by sea route in the delta of Irawadi. Indians also penetrated further east founding kingdoms and colonies. Earliest Aryan settlement is not known yet, however certainly before the Christian era; before their arrival the land was thinly populated by primitive tribal groups, Aryan settlements finally enabled the natives to communicate and deal with outside world; enriching intellectual patrimony of humanity. Methods of Indian penetration were not by conquest rather always to have been peaceful. The term Burma is derived from Kshatriya title “Varma/Barma.” From thirteenth century Kshatriyas began to lose their separate identity and became ingredients of today’s population but not without leaving traces. Without special mention of Indian state Manipur the history of Burma is incomplete; Manipur served as India’s gateway to Burma and Southeast Asian peninsula from prehistoric time. Long before that the Kshatriyas settled on this beautiful land, the princes of upper India passed through this land. The Kshatriyas of Manipur also ventured east as in case of Raja Dhwaja (550BC); those who were not ambitious did not leave Manipur. One may wonder why Kshatriyas could not prosper staying in Manipur than Burma? Well, geography played a vital role for prosperity of any kingdom; land locked tiny valley and hills of Manipur had very less to offer for ambitious princes in comparison to Burma’s vast fertile plains of Irawadi and Chindwin rivers. For ages Irawadi was a vital trade route connecting the sea ports, international trade ships easily reached up till the heart of Burma. Thus, Burma was easily connected with outside world for development and prosperity whereas Manipur had no such geographical advantage. (1) Pre Pagan period (from first millennium BC. to circa 10th century AD). (2) Pagan period (from c. 9th century AD to c. 1287AD). (3) Post Pagan period (from c. 14th to c. 20th century AD). This article includes period (1) & (2). Central and Upper Burma: According to Burmese royal chronicle Rajavamsa, Kshatriya prince Abhi Raja left his home with his followers in Northern India, enroute Manipur. He came with an army and his followers founded the first kingdom in Upper Burma in about 850 BC. He built the city Hastinapur/Sankissapur (modern day Tagaung), the ruins of which still exist. Fuhrer, a German archaeologist in 1894 found a Sanskrit inscription dated 416AD tells, the city was found by immigrants from Hastinapur (an ancient city near old Delhi). One of the sons of Abhi Raja succeeded him and the other left the kingdom and established himself in the south. As time passed their progenies spread all over Burma founding independent principalities/kingdoms. Some of the Kings of this dynasty were Abhi Raja, Jambudwipa Raja, Sangassa Raja, Vippana Raja, Devata Raja, Munika Raja, Naga Raja, Indra Raja, Samuti Raja, Deva Raja, Mahindra Raja, Vimala Raja. In about 550 BC, another band of Kshatriyas from Manipur, led by Raja Dhwaja conquered Hastinapur. Sixteen kings of this second dynasty reigned. Next band of powerful Kshatriyas of Mauriyan dynasty (of Ashoka the great) marched from Manipur to Burma; built a city in upper Irawadi, the ruins of which still exist. The city is now corruptly known as Murera. Before their penetration to Burma, the Mauryans stayed in Manipur. The Moirang principality was named after them; Mauriya+Ang=Mauriyang>Moirang. These Kshatriya adventurers built a number of cities/principalities/kingdoms along Irawadi and Chindwin river based on Vedic model of town planning Mandala and Sudarsana. Archaeologists found more than 18 walled cities dating back from 1st millennium BC to 800 AD. Hastinapur was the earliest city (850BC.). Bishnupur (Beikthano), named after lord Vishnu, was the most important urban site. It served as the cultural and political capital between 200 BC to 600 AD. Srikshetra, the largest city, flourished between 5th-9th century AD. Sanskrit inscriptions in Nagari type script shows reign of Vikrama dynasty – kings Suryavikrama, Harivikrama, Shivavikrama are few to name. 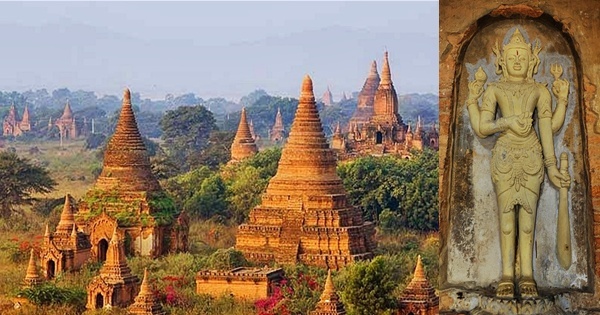 Chinese pilgrim Hsuan-tsang mentioned several Hindu kingdoms of Burma, Sri-Kshetra being one of the capital cities. Chinese annals also spoke of these walled cities. Tang chronicle of China informs; in 800 AD. 35 musicians and dancers from Burma arrived in Chinese court, played music and sang in Sanskrit language. For a certain period people of Burma were known as Pyu till 9th century AD, a corruption of Sanskrit Priya (dear), possibly they used to address one another Priya. Chinese chronicle called them Pio. Vaishali: Arakan has an independent history, to some extent separated by the mountainous range from main Burma, situated along the eastern shore of the Bay of Bengal. Ancient name of the region appears to be Raksha (guarding). Mythologically, it refers to their abode on Mount Meru guarding the palace of Lord Indra. Ramavati and Dhanyavati were two capitals. As per the local chronicle, the first king was from Banaras (India). Local chronicle place the foundation of this kingdom in 2666 BC. After being ruled by several kings a new dynasty Chandra-Surya supplanted them in the year 146 AD, having last name Chandra – Rasachandra, Devachandra, Bhumichandra, Bhutichandra, Pritichandra, Saritichandra including Manavira, Vrajagati, Annathava. Their new capital city was named Vaishali. This band of Kshatriyas probably came from ancient Vaishali of Bihar, an ancient Indian state. They established marital and diplomatic ties with rulers of main Burma. By the end of 13th century AD this dynasty began to disappear. Coins and artifacts of Hindu iconography, idols of Hindu pantheon, inscriptions in Sanskrit, Hindu temple ruins have been discovered from different parts of the region. Ramannadesh: Lower Burma, now known as Mon state also has its own history. A cosmopolitan cultural state from the very beginning, colonists from Northern India, Orissa and Krishna-Godavari river basin of Southern India (Andhra) formed this ancient kingdom Ramannadesh (the land of lord Ram), in the delta of the Irawadi river. Dwaravati and Hansavati (Pegu) were major capital cities. At the height of glory, their domain extended deep into modern day Thailand. They adopted Manu-Samhita and the Hindu concept of Devaraja. Few of the kings were Dharmapala, Dharmadhwaja, Uttara Raja, Brhammdatta. They introduced advanced cultivation and irrigation system. The city also became a center for learning of Buddhism in later period. It is believed their culture spread all across Burma during the reign of emperor Aniruddha of Arimardanapur (Pagan) in the 11th century AD. Due to absence of great natural barrier between main Burma and Ramannadesh, they have often been at war, having regularly plundered each other’s capitals. It has a reputation of being the earliest kingdom in whole of Southeast Asia to receive Buddhism, sent by Ashoka the great. Historians believe this region was originally inhabited by cannibals. Religion and Custom: “What the excavator finds in Burma is often Hindu rather than Buddhist. In some sculptures Buddha appears as an incarnation of Vishnu.” says historian G.E. Harvey. Vishnu-Vaishnavism was widely practiced. Majority of the Hindu images are almost all associated with the god Vishnu. Several representations of Vishnu reclining on Ananta and Garuda have been discovered over a wide area in Burma. Literary evidence shows some of the kings declared themselves incarnation of Vishnu. Shaivism felt some importance in Vaishali (Arakan). Other Vedic/Hindu images of Indra, Shiva, Ganesha, Brahma, Hanuman, Surya, Durga etc. also found. Coins with Hindu iconography and terracotta tablets with Hindu objects engraved on them also found. The famous Vishnu temple (Nathlaungkyaung) is the only surviving Hindu temple in Arimardanapur (Pagan). The famous Shwezayan temple at Thaton, said to have been built on a Vishnu temple of 5th century BC. Also the famous Shwedagon temple at Rangoon would have been built on a 5th century BC Hindu shrine. They practiced Vedic cremation of dead, preserved the ashes in urns. Abundance of such burial urns are found from all ancient sites. Material evidence suggests, Buddhism arrived in 4th century AD yet Hinduism continued. Even after Buddhism was firmly established after 1300AD, Brahmins continued to play a central role at the royal court level as well as general public. Despite Buddhism being the dominant religion then, the ruling classes continued practicing certain Vedic rites. The royal coronation ritual was done according to Vedic/Hindu rites. Burmese chronicles also mention four-varna system, brahman, kshatriya, vaishya and shudra. Indian astrology is practiced in Burma. Speech and Script: According to Sir. A. Phayre, Sanskrit was the court language, in some cases Pali also used. Even 19th century compilation of Burmese chronicle Rajavamsa was in Pali language. Script used in Burma through the ages draw their source from Brahmi. Variants of Gupta and Eastern Nagari script are also found. In 1894 a German archaeologist found a Sanskrit stone slab dated 416AD from ruined city Hastinapur (Tagaung). Tang chronicle of China confirms thatin 800AD a cultural troop from Burma arrived in the Chinese court; they sang in Sanskrit language. Sanskrit inscriptions written in Eastern Nagari type script shows rule by Vikrama dynasty at Srikshetra. Pali superseded Sanskrit as the language of sacred books in the 11th century AD after king Aniruddha made Buddhism the state religion. Earliest form of Tibeto-Burman language goes back to 12th century AD. A language called “Pyu” written in Indic script was found in several inscriptions but not yet deciphered. Throughout the ages, Burma used various Lunar-Solar calendar of Indian origin. Tradition of writing on palm tree leaves also derives from India. Downfall: Historians believe continuous raids from Gandhar (Yunnan) brought death to these kingdoms in the 9th century AD with thousands taken as captives. Gandhar was another Kshatriya kingdom bordering North-east of Burma. Chinese Tang chronicle recorded this invasion. This invasion left the country’s frontier completely defenseless causing unstoppable inflows of tribes from eastern Tibetian region into the plains of Irawaddy; later these tribes went on to become the most essential in forming Burmese population what we see today. After a long silence in the middle of 11th century AD; a king with great zeal and power emerged from the ruins of previous Kshatriya kingdoms. He was emperor Aniruddha of Kshatriya descent; his ancestry being traced to the earlier rulers of Indian origin. He introduced new military tactics, built temples, dug up canals and ponds for agricultural and economic growth. One tablet inscription mentions his name as “Sri Maharaja Aniruddhadeva”. From his capital Arimardanapur (Pagan), he quickly extended his domain and ended up unifying whole of today’s Burma after the conquest of Ramannadesh (Mon state) and making Vaishali (Arakan state) a tributary state. He was a Vaishnavite prior to his conversion to Buddhism by a monk from Ramannadesh. Buddhism was made the state religion yet Hinduism continued to co-exist. From this time on Vedic/Hinduism began to decay gradually. Anniruddha married an Indian princess named Panchakalyani of Pattikera kingdom, located in the eastern part of modern day Bangladesh. His successors continued his success; one of the later kings repaired the famous Buddhist temple of Bodh Gaya (India). Under this dynasty, the temple city of Arimardanapur grew in splendor and the empire flourished for nearly two centuries. The dynasty grew weaker due to internal feud and incompetent kingship; vulnerability invited the Mongol invasion. After sweeping nearly whole of China, one of the Mongol governors (successors of Ghengis Khan) established himself in Gandhar (Yunnan) and attacked the cities. Plundering and looting apparently brought to an end of this dynasty in 1287 AD. The Mongol army withdrew very soon, leaving the empire in a state of political disintegration. Taking advantage of the situation Shan chiefs of Tai-Shan tribe raided other weaker and smaller principalities of the country. Thus 13th century AD witnessed end of another Kshatriya/Hindu era in Burma. Kshatriyas began to lose their separate identity probably during this period. Some Brahmins could save their separate identity though not racial purity. In later period, Burmese kings of mixed blood emerged dominant power in the region attacking all their neighbors. They also successfully blunted Chinese aggression. Art and Architecture: Architecture of Burma fundamentally claims to derive from North India. Well-fired bricks and patterns are Northern Indian type though artifacts little differ from their Indian prototypes because of their long separation from their origin in India. Mandala and Sudarsana of Vedic beliefs/cosmology used in city planning were significant, the adoption even extended to the later cities like Ratnapur (Ava), Amarpur, Mandala (Mandalay) etc. The great temple city Arimardanapur consists of 2,230 buildings scattered over twenty-five square miles; home to Hindu-Buddhist temples, stupas, public buildings, paintings and sculptures. The temple architecture suggested several Hindu temples were converted to Buddhist structures. North Indian Nagari style Vimana is a hallmark; paintings of the structures are very much Indian. The wooden palaces what we see today are also derived from Northern India. It’s to be noted that ancient Greek and Chinese travelers extensively wrote about gorgeous palaces and temples of wood in Pataliputra and other cities of ancient India. Race and Migration: According to historian G. Coedes, from earliest times, the population of this region was composed of very diverse racial elements, some of which related to the Negritos, Papuan-Melanesians. This fact leads to a conclusion: that the earliest inhabitants were related to those who inhabited the islands of the Pacific today. Historians Noel F. Singer and D.G. Hall refers aborigines were cannibals. Tibetian and Shan of Tai-Shan of Mongoloid racial stock are two important ethnic groups of today’s Burma. Historians believe that the Tibetians migrated from eastern Tibet to Burma in the 9th or 10th century AD when the country was in turmoil. Tai-Shan; Northern China was their original home, they first entered the history of Southeast Asia in 11th century AD. They did not enter the plains till 13th century AD. One of the branches under the leadership of Sukapha invaded Assam of India in 1228 AD. The Kachins entered Upper Burma when the British annexed it in 1885. Other numerous hill tribes of Mongoloid racial stock also make a large population of Burma; their origin and migration would require a broader study. Aryan racial elements are completely supplanted by the Tibetian Mongoloid racial element. Burma could prove to be a paradise for anthropologists. Nomenclature: Burma is a derivative term of Kshatriya title “Varma/Verma/Barma.” The country was also known as Brahmmadesh (land of Lord Brahmma). Brahmma is pronounced Mrahmma in Tibeto-Burman, Brahmma>Mrahmma>Mramma>Myamma>Myanmar. Once upon a time the country was known as Indradwipa. All ancient cities had Sanskrit name; Bishnupur (Beikthanmyo), Hastinapur/Sankissapur (Tagaung), Sri-kshetra, Binaka, Arimardanapur (Pagan), Ratnapur (Ava), Amarapur, Mandala (Mandalay); Ramavati, Dhannyavati, Vaishali; Ramannadesh, Dwaravati, Hansavati (Pegu). River Irawadi or Ayeyawady, literally meaning river of elephant was derived from Sanskrit name Airavat, the elephant of Vedic god Indra or may be from Sanskrit name Iravat. Ptolemy, the geographer, tells us that in the 2nd century A.D. many places in Burma had Sanskrit names. Such was the force of the penetration of Kshatriyas that its legacy still persist, this legacy includes Sanskrit & Pali elements in the vocabulary of the local languages, the lunar-solar calendar, adoption of Dharmashastra and Manu-Samhita in their administrative and legal framework. The Harivamsa, the Ramayan, the Mahabharat, and the Puranas are the principal sources of inspiration for local literature. The Burmese poetry tradition of Niti (notably the Dharmaniti) also has Indian origin. The Ramayan still remains favorite theatrical play. Vedic/Hindu deities Indra (Thagyamin), Saraswati (Thuyathadi), Shiva (Paramizwa) Vishnu (Beikthano) are still worshipped by the Buddhist Burmese. The traditional Burmese greeting is “Mingalaba” corrupted from of Sanskrit “Maṅgala” (auspiciousness). Traditional Burmese marriage belief is as per the Hindu god Brahmma; typically a Brahman presides over, blows a conch shell to commence and joins the palms of the couple, chanting Sanskrit mantras, and blows the conch shell to end the marriage ceremony. Burmese funerals are typically cremation. Traditions of kingship coronation ceremonies are Hindu not Buddhist. Burma was theatre of revolutionary changes; without India its past would be almost unknown. Historical study and research of Burma at this stage is relatively in an unadvanced state, the work is far from complete, and each year new inscriptions are dug up from the soil. “The northern part of Kubo valley, which is the direct route from Manipur towards Burma, is still called Mauriya or Maurira, said to be the name of the tribe to which Asoka belong”. German Archeologist Fuhrer’s inscription- in 1894 he found at Tagaung a stone slab dated 416 AD with a Sanskrit inscription telling how Tagaung was founded immigrant princes from Hastinapur (old Delhi). 7th century Chinese pilgrim Hsuan-Tsang mentioned several Hindu kingdoms of Burma, SriKshetra being one of the capital cities. “The Burmans, we are told, call their Code generally, Dharmasath or Shastra; it is one among the many commentaries of Manu-Samhita.” (continuation of Manu-Samhita in even later Burmese society). – Michael Symes, An Account of an Embassy to the Kingdom of Ava in the Year 1795. 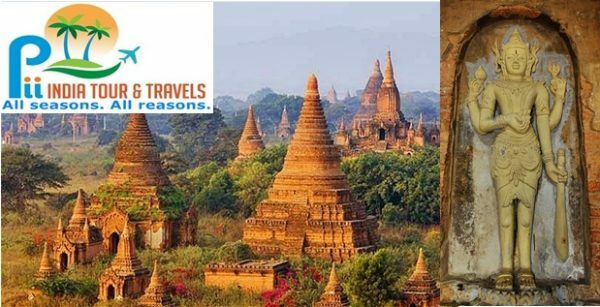 Explore Burma with Pii India Tour and Travels. “From the Brahmaputra and Manipur to the Tonkin gulf (Vietnam), we can trace a continuous string of petty states ruled by those scions of the Kshatriya race (Aryan), using the Sanskrit or Pali language in official documents and inscriptions, buildings, temples and monuments of old Hindu style and employing Brahmin priests at the propitiatory ceremonies connected with the court, and the state”. – G. E.Gerini, Researches on Ptolemy’s Geography of Eastern Asia. (Views and research of this article are solely by the author). Somnath Singha has keen interest on Indian History. He is continuously involved in historical studies and research. One of his goals is to trace the origin of the Bishnupriya Manipuri race and migration of Aryans beyond South Asia.